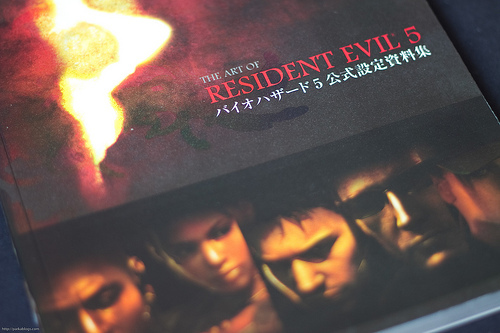 This is actually the translated version of the Japanese book バイオハザード5 公式設定資料集 (Biohazard 5 Official Art Works), published in 2009. It's finally being translated and published by Udon Entertainment. Better late than never. It contains the concept art for the characters, creatures, zombies, environment as well as interviews and some discarded visual ideas. The art comes in the form of sketches, coloured illustrations and 3D computer graphics. The high resolution in-game character profiles look really good. For fans of anything zombies, these book has plenty to delight you. The designs for the undead and creatures are very cool. There are worm infested zombies, rotting dogs, plenty of tentacled disgusting lifeforms and gruesome mutations. This world is pretty sick. The chapters follow the game play, presenting art for the areas and then the enemies there. Compared to the characters, there are less art for the locations although there are some storyboards and right at the end are some photos of actors playing the main characters in front of green screens. Recommended to gamers, sci-fi and game artists. The one of the right is the Japanese edition. Which one would you suggest has the better overall print quality? The English or the Japanese release? The book spine for the Japanese edition is more flexible, hence more resistant to creasing. The English edition is way cheaper. The graphics and the designs for this game are amazing. I can not say the same for the game play though, but the book sure looks very promising.